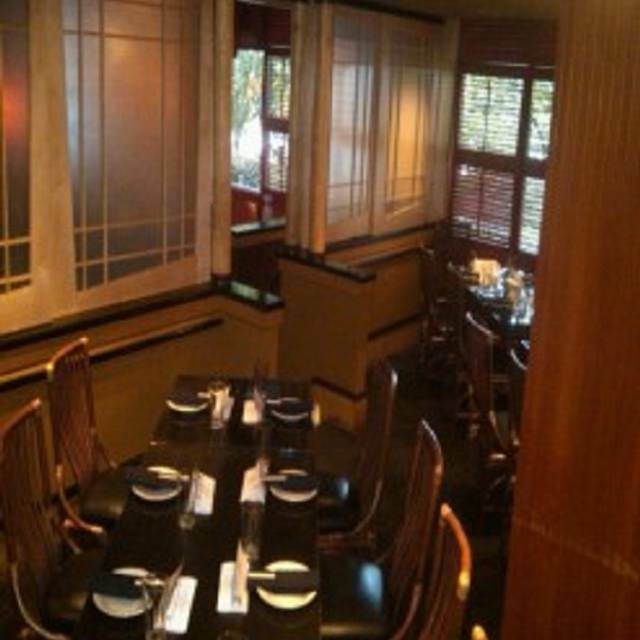 Semi-Private dining for up to 38 guests in out dining room is available. Our private banquet rooms can accommodate sit-down dining up to 50 people, and cocktail style service to 80. Banquet rooms are located in the Paramount Hotel, in downtown Seattle. Great place for any gathering!! This cross-cultural restaurant concept has reinvented some of the most popular dishes from China, Japan, the Philippines, Thailand and Singapore and designed them to appeal to a wide spectrum of guests. Dragonfish’s diverse selection of portion sizes makes it easy to graze or gorge, a clever concept that serves many types of appetites at all hours. I thought prices from the menu were pretty reasonable, the level of service was phenomenal! It would definitely come back. It was a great meal. Had a wonderful meal and a wonderful time. They have consistently had the greatest food and service. We will always return?!!!! Great place for a casual dinner before a show at the Paramount. Reminds me of the Izakayas in Japan. The food was just like my Japanese family made at home, hearty and yummy, but with a bit of extra flair. 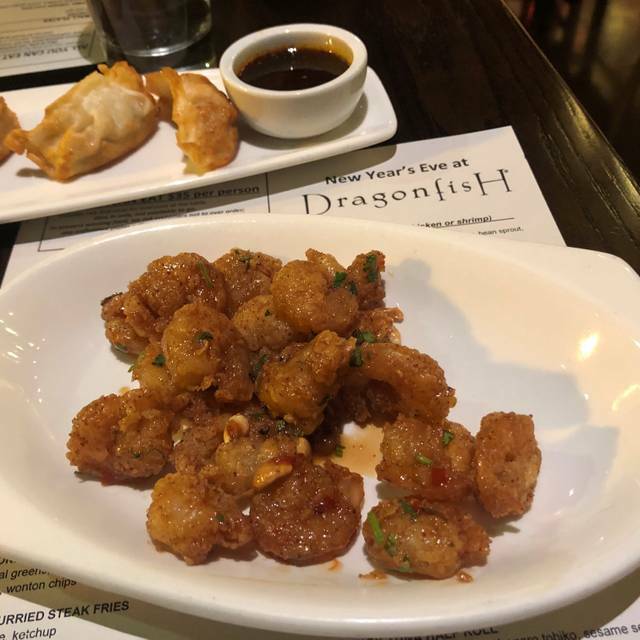 Dragonfish really is the best happy hour in Seattle! Dragonfish is one of our go-to restaurants for theater nights. The food is great - we always order the 5-spice salmon, and just discovered the tamerind noodles - yum! But anything there is excellent. Our server this time was Peter - efficient and fun. All-round good experience. We have gone to Dragonfish before each performance at the Paramount. However, this last time seemed quite a bit more expensive and I found that the selection seemed limiting. I recently changed my diet so that I cannot have eggs, dairy and gluten. This meant that I could really only find lemongrass chicken and some jasmine rice to eat plus one California roll. I would love to see the menu expand and the prices not so high. It was just myself and 3 kids and the bill was $140 (before tip)!!! Before the next show, we plan on checking out a new restaurant. 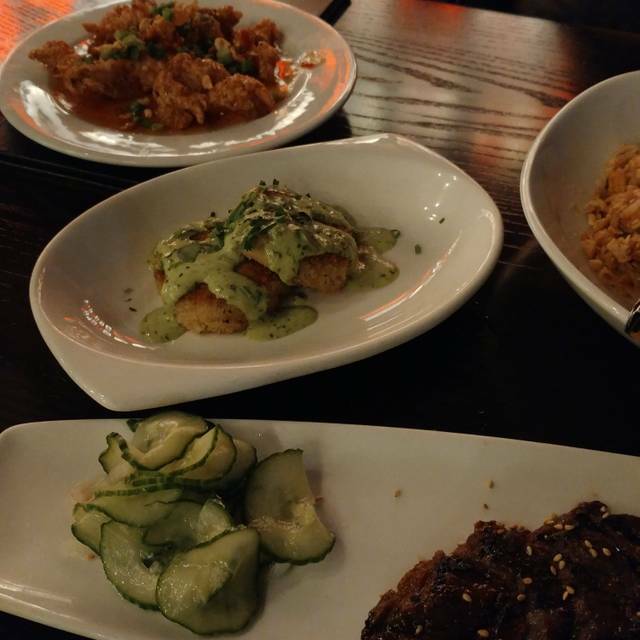 We always enjoy Dragonfish--especially their Happy Hour menu. Lots of small dishes to try and to share and you can eat copious amounts for minimal $$! I ordered shrimp pad thai - the shrimp weren't properly cleaned. I sent it back and they brought me plain pad thai. Instead of comping the dish, they credited the cost of the shrimp pad thai and then charged for the plain pad thai. not intrusive and shared which dishes Dragonfish is known for and that everyone enjoys. We made a reservation 2 days in advance. When we arrived a few minutes early we were asked to wait a few minutes so that they could get our table ready. Nearly 15 minutes later, we were seated at a high top table in the bar area rather than a table in the dining area. They did accommodate our request for a standard sit down table in the dining room but it was an uncomfortable experience of squeezing our way through a maze of people to get there. The food was okay but nothing special for how much it cost. We had to wait nearly ten minutes just to get soy sauce so we could eat the spicy tuna roll that we had ordered. We both thought the chicken in another dish was undercooked, and we heard a woman behind us sending her shrimp dish back for being undercooked. I wasn't very happy about paying $71 for 4 dishes. All in all a very disappointing experience for our date night out. There needs to be a new noise level for reviews called "Unable to hear your table partners". Dragonfish really needs noise abatement or to identify patrons who do not want the Vibrancy of drunken patrons's chatter. The bar is not the place to sit for dinner, so ask for seats away from this area if you want that experience. Also the staff is pretty harried simply because they are serving a full menu in the bar and the stress of serving full meals, handling happy hour, and trying to please everyone shows. The rating for the service is reflective of how Dragonfish manages this, not the individual server. She quite honestly deserved combat pay for the service she provided. 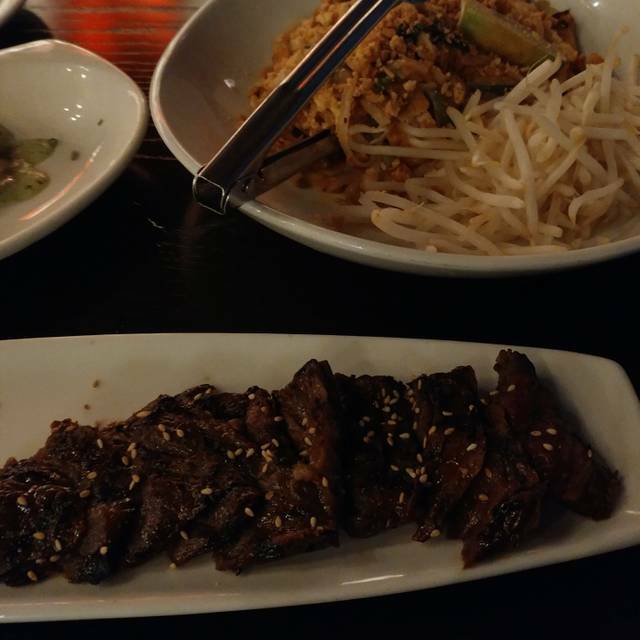 The food is great and each time we have been there, it doesn't disappoint. But seriously, sit away from the bar for a better dining experience unless you are there for the happy hour and noise. Never disappoints! Such yummy food! Love the Basil Bacon Fried Rice. 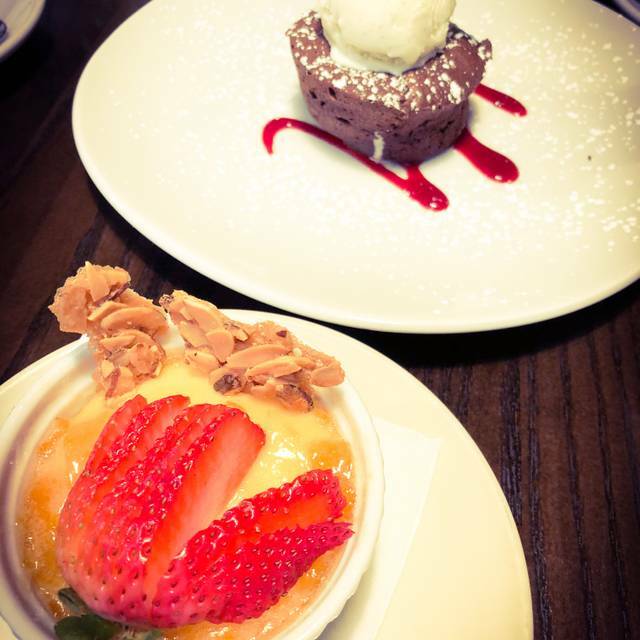 We also had both the Poke and Crab Rolls which were fantastic, followed by the Heavenly Chocolate Cake. Such a fun evening with my daughter. 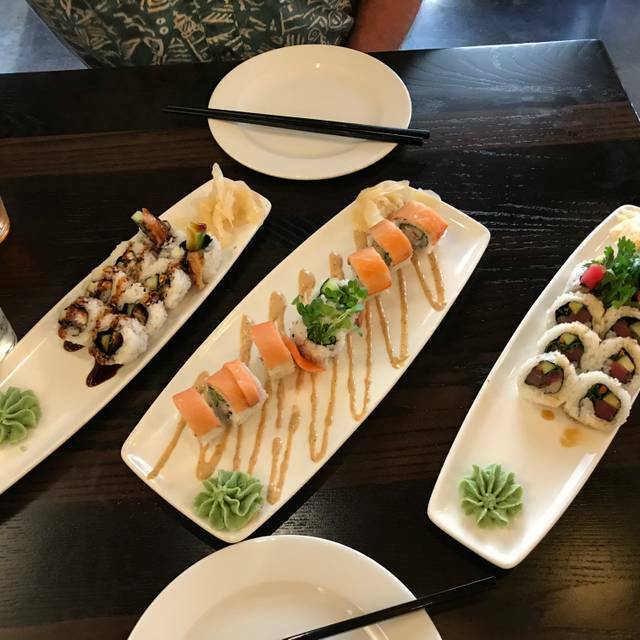 Dragonfish is our go to when we see a show at the Paramount. they have fabulous food, great presentation, give you a healthy serving. Love their bento boxes, great menu variety. I love everything about this place. Use fresh ingredients, everything tastes so good! Great place to go before seeing a show at the Paramount. The food was delicious. Our server, Sarah, was attentive and very helpful in steering us to some great items off both the happy hour and dinner menus. A little loud for conversation but not horrible. The food was delicious. Got 6 items off the happy hour menu and enjoyed them all. We especially loved the Rickey Lime Shrimp and Tuna Poke Don. 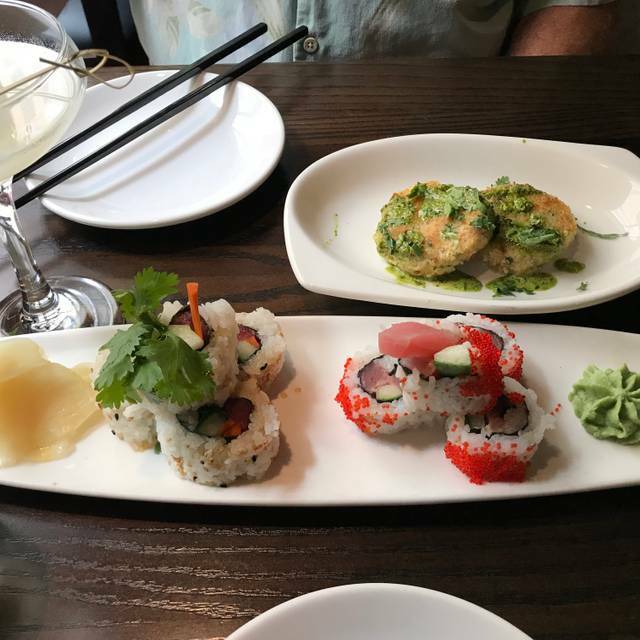 We tried the Dragonfish Lemongrass Collins and Lychee Drop and both were delicious. Our waiter was friendly and attentive We will definitely be back. Our waiter was very good. The ambiance was fair at best. The small plate dishes were very good. The larger plate cuisine was Average at best. Worth a one time visit. Do not plan to revisit. Food was interesting. Our waiter was fine. Receptionist and manager were rude when we didn’t want to be seated in the bar or next to the kitchen for dinner. Plenty of tables available in dining area, they didn’t ask us where we wanted to be seated, just put us where they wanted until we objected, then moved us with snippy comments. Sayonara forever! Food was great, service good. Worth trying before an event at the Paramount. I hadn't been to Dragonfish in years. They must have remodeled because it seemed so much bigger. Plenty of seating. The happy hour food and prices are amazing! Service was slow, food came out for 3 of us, other two had to wait more than 5 minutes for their entrees. Very unengaged waitstaff and the food was OK-to-good. Excellent food at a great price point! Love their bento boxes! Mellow, clean and the staff was fun, friendly and attentive. Happy hour food and drink selections were very enjoyable. Happy hour food was great for the price. Great selection, lots of vegetarian items. Try the eggplant fries. Great food! 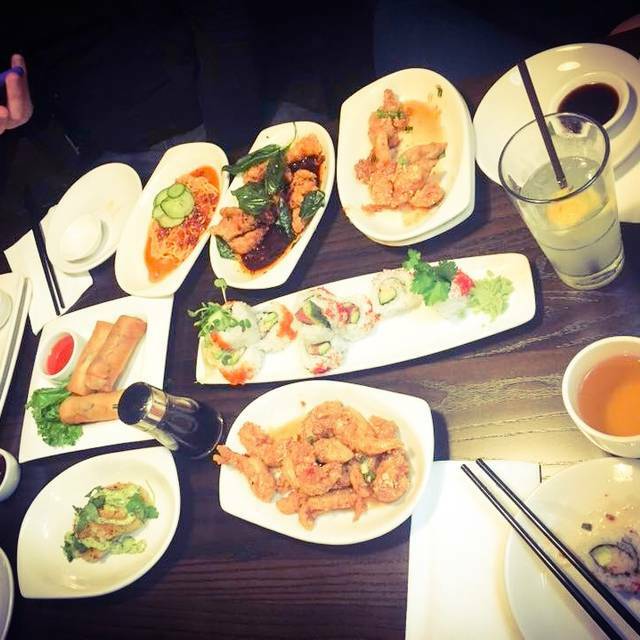 Love ordering lots of small dishes and sharing. Great quick service. Close proximity to theatre. The happy hour has great items at a great price. Two of us shared 5 apps (including a 2nd order of Dragon Noodles) and four drinks and didn't break $4 for anything. The atmosphere was a fusion of classic and modern, the music was at a good volume to allow for conversation, and the wait staff was attentive. I would highly recommend the Dragon Noodles and Panang Curry with shrimp. The curry fries were also tasty. Really exceptional place! My go to for lunch downtown. Food is really good, well priced and the service is exceptional - unpretentious and friendly. Highly recommend! 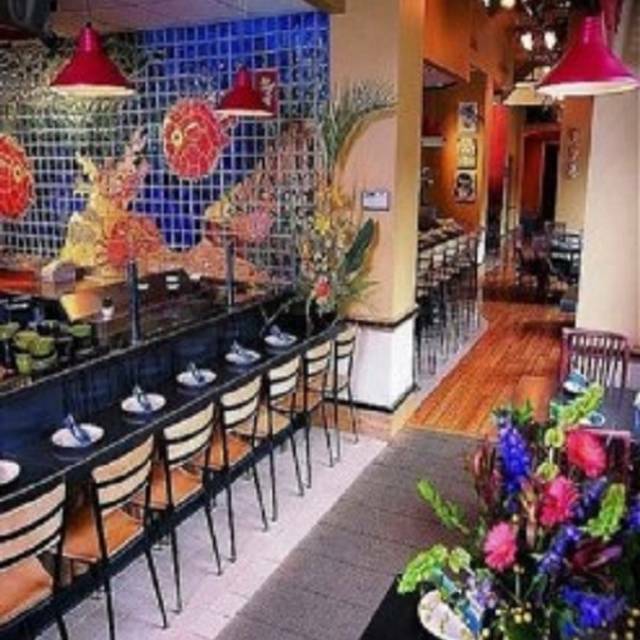 We chose Dragonfish because it was close to the Paramount Theatre! Our reservation was for 5:00 pm after a matinee. We got in on Happy Hour prices but also ordered a few regular priced items! Service was great and the food was great! I would definitely plan to eat there after my next visit to the Paramount! We got stuck in traffic -30 minutes late for our reservation yet they kindly seated us and made sure we were served quickly so we could get to our show. Great good and ambience. Service took awhile. Leave extra time if going to a show. We went for the first time on a recommendation. We tried things we had never heard of which was really fun! Our waiter helped explain some of the dishes. The food was great as was the service. We were going to the theater and they kept our leftovers for us! Dragon fish never disappoints. Ask for Pete. He was our server and he was incredible! Funny, knowledgeable of the menu, abs quick witted it was a great dinner! I may recommond Dragonfish Cafe only if I know someone likes very spicy foods. Everything we ordered was spicy, even if it didn't say it on the menu. Most of the people I dine with cannot eat such spicy foods. Also, with a 6pm reservation, they ran out of the special dish I ordered before I could get it.